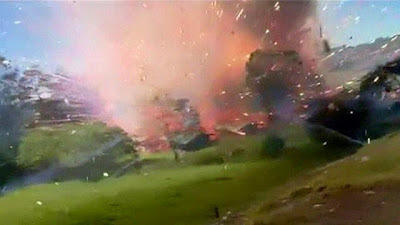 A cameraman from a local TV station was knocked to the ground but continued filming as a series of spectacular blasts occurred in Granada, Columbia, over the weekend (VIDEO IN LINK). A fireworks factory caught fire and its contents erupted, rocking neaby houses but only causing minor injuries. It took a team of 30 firefighters 6 hours to put out the blaze, and arson has not been ruled out as the cause.